Mr Solo Too on its way to victory at the 2017 Great Race. DEFENDING champion Mr. Solo Too is aiming to capture an unprecedented 18th Great Race title tomorrow morning for the historic 50th anniversary of the inter-island race. The race takes off from 7.15am at the Foreshore in Port of Spain with staggered start times for the various classes and ends at Store Bay, Tobago. “We are as confident as all the other entrants in the Great Race; believe it or not anyone can win, because you never know what can happen.” throttleman Darin Marshall said yesterday. Marshall said Charles is an iconic figure in the history of the Great Race. Marshall said Saturday’s race can never be predicted as there are too many variables. Despite the challenges, the three-man crew of Marshall, driver Charles and navigator Gino Fusco seem to have it under control seeing that they have the experience and expertise from winning all those years. It wouldn’t be all smooth sailing for Mr. Solo Too in the A-Class (130 mph) with the likes of Motul Monster returning for the first time since claiming a hat-trick of titles from 2013-2015. The father-son pairs of Joey and Joshua Sabeeney and Peter and Daniel Peak lead the points table from the regattas held this year, winning 10 out of the 12 races for the year. Cat Killer is a relatively new boat on the scene but has already made waves by placing third last year in their first ever attempt. Throttleman Lee Pollonais and driver Gary Johnson are aiming to do even better with the experience gained over the year. The crew of Ironman is expecting to improve on their consecutive second-placed finishes over the last few years. Their power boat racing season almost ended prematurely when they collided with Jumbie in May at a circuit race regatta close to the Trinidad Yacht Club in Glencoe. Having won in 2011 and 2012, throttleman Guy Costa and driver James Hadeed will be eager to lift their third title. The first-time winner in 2016, Paramount is confident of winning with the largest boat – a 50 feet Mystic. Throttleman Donald Webster, driver Jason Laing and crew chief Patrick Balgobin hinted that they are eyeing the race`s record barring any mechanical issues. Throttleman Justin Decle and driver David Brash for Jumbie will be returning to Great Race after a two-year absence and aim to give it their best shot. Americans Nigel Hook (throttleman) and Jay Johnson (driver) will be looking to cause an upset, being the surprise package with their boat Lucas Oil which is a Silverhook 48 GP. The foreign team spent the last few days strategising their race and learning the conditions of the route. The TT Power Boat Association was contacted by the Guinness Book of Records for having the longest consistent offshore race in the world earlier this year. 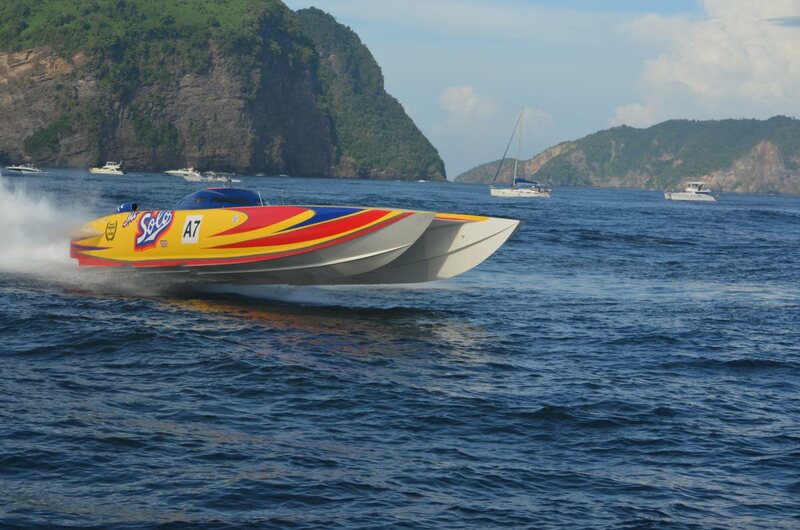 Fans can view the race at the Foreshore, TT Yacht Club, Maracas Bay, Grande Rivière and Store Bay, Tobago. Reply to "Mr Solo Too eyes 50th Great Race glory"